My Mom and I exchange recipes quite often. Sometimes, it’s something that we saw, thought it looked yummy, and passed it along to the other person to make first to see if it’s any good. This is one of those recipes. The verdict: It’s good. This is great to do if you have a loaf of bread that’s starting to get a little stale and you can’t use it for sandwiches. You can also add some chili powder if you want a little kick. Drain and flake salmon. Set aside. Cut bread slices diagonally to make triangular pieces. Arrange them in a spiral in a greased 9-inch pie dish to cover the bottom of the dish. Arrange remaining triangles around the edge to form a crown (or be lazy and do it the way I did…). Trim off the parts that stick too far up over the edge. 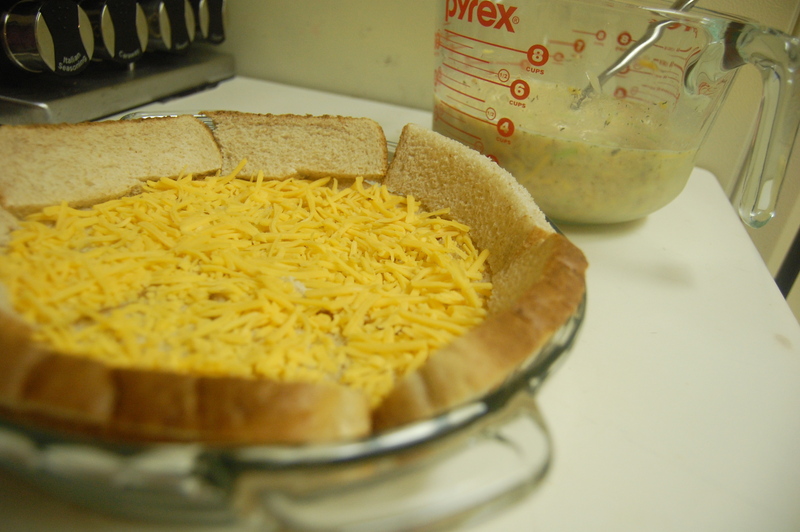 Sprinkle 1/2 cup cheese over the bread at the bottom of the pie dish. Whisk eggs, milk, dill, salt and pepper. Stir in salmon, green onions, and remaining 1 cup of cheese. Spoon evenly into pie dish. Bake 40 minutes or until the center is set. It turns out really pretty. You can even sprinkle some green onions on the top after baking for some extra color. It’s really filling, so it actually lasted Stephen and I three meals. Or maybe two and a half. 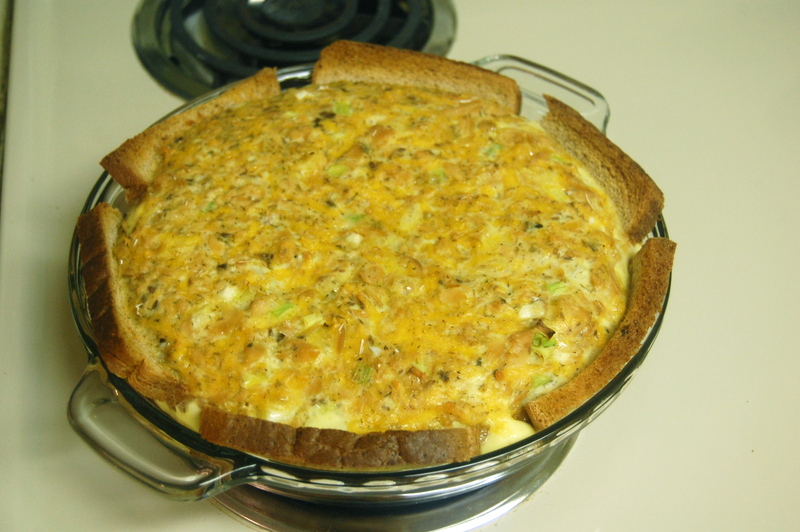 If you like quiche, I would definitely recommend trying this! 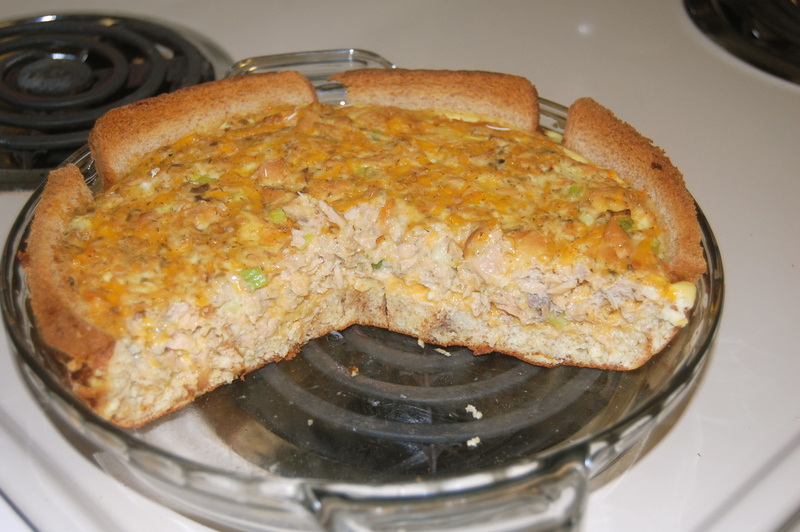 I have a similar salmon puff recipe, but what a great idea to use slices of bread! i’ll keep that in mind when I don’t have time to make a crust! It appears you’re right. I’ll have to bookmark you and stop by again! Thanks for testing that one out for me sweety! I’m ready to try it now!